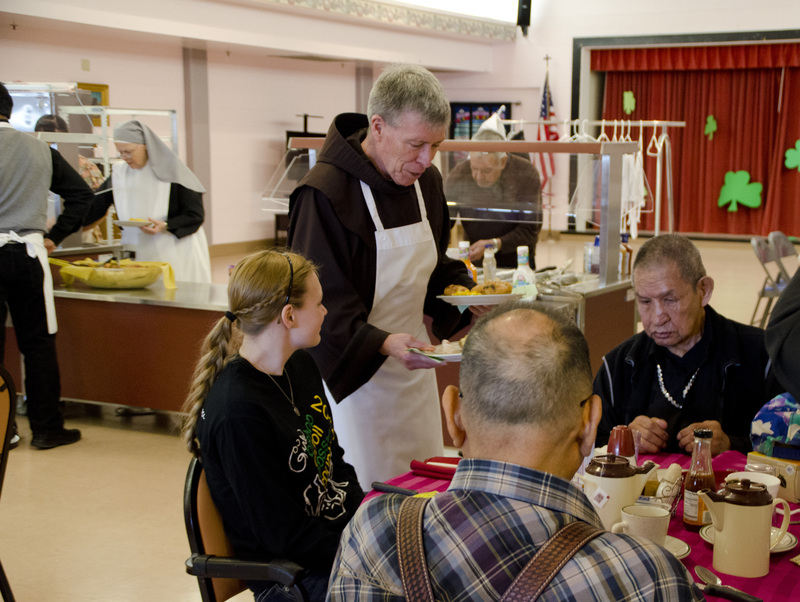 Walk into the dining hall of any home of the Little Sisters of the Poor on March 19, and you may see a number of priests, donned in white aprons, serving meals to the residents. An annual tradition, the priests come to the home because March 19 is the feast of St. Joseph the Worker, an important patron for the Little Sisters. 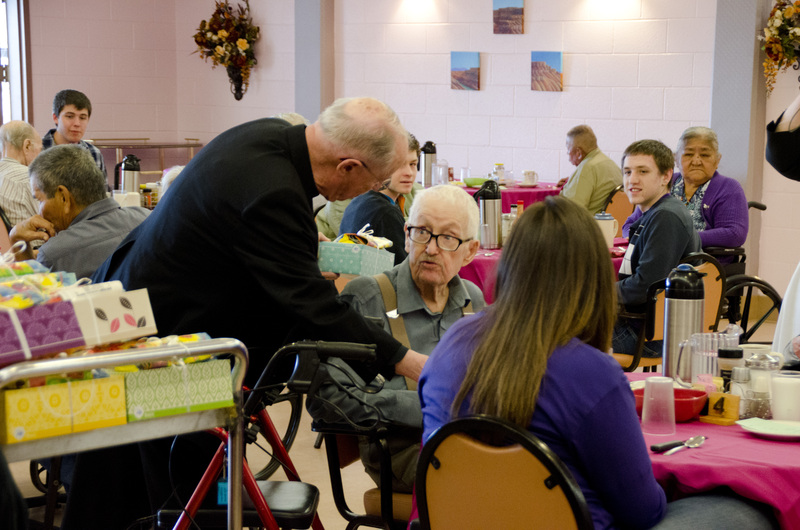 At the Villa Guadalupe home run by the Little Sisters in the Diocese of Gallup, the feast day was marked this year by a Mass, celebrated by Bishop James Wall, with the concelebrating priests in attendance afterwards to serve the midday meal to the elderly. According to Mother Mary Thomas, the superior of Villa Guadalupe, the same activity was taking place in other homes across the world. Fr. Dale Jamison, pastor of St. Mary’s church in Tohatchi, serves meals to residents at Villa Guadalupe. St. Joseph is held nearly in as high regard by the Little Sisters as their foundress, St. Jeanne Jugan. Depictions of both saints can be found prominently placed throughout homes run by the order. “St. Jeanne Jugan took St. Joseph as the protector of the congregation, and we Little Sisters, each one of us carries his statue in our pocket,” said Mother Thomas. “When we make a profession, we each hold a statue of St. Joseph”. She described how she has carried her own statue with her for 27 years, since her first procession, and how she turns to St. Joseph in times of need. Mother Thomas describes an example of devotion from the early days of the order. Sisters working in the kitchen would place the peelings of apples and other food needed for meals in front of a statue of St. Joseph, and would receive the items they needed as a result of their prayers. Recently, a dog that the sisters had adopted for the residents went missing from the property. For this, too, they turned to their patron. By inviting priests to join them for service on their patron’s feast day, the Sisters hope to spread the spirit of devotion to the elderly started so many years ago by St. Jeanne Jugan. Fr. James Walker, pastor of St. John Vianney church in Gallup, hands out gifts to residents in celebration of the feast of St. Joseph. The priests were joined this year by a youth group from Wichita, led by their pastor, who had come to work at the home during their Spring Break. As they took meal orders and carried plates, the visitors laughed and conversed with one another, and with the elderly residents they served.